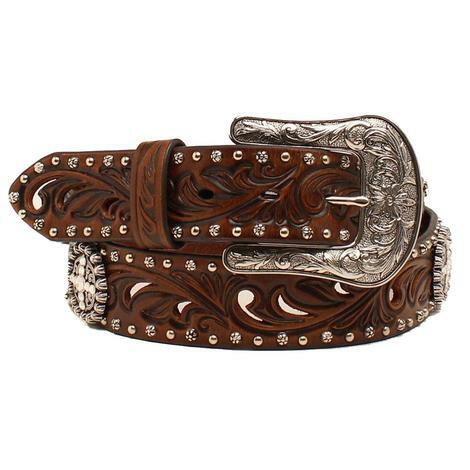 This genuine leather belt features brown tooled leather with multi chevron stitching, turquoise flower conchos, and an embossed silver buckle that is also removable. Measures 1.5" wide. 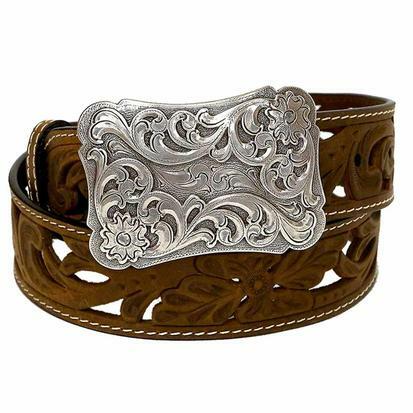 This Nocona women's waist belt features a beautiful brown western floral print faux leather disc link design with silver studs and large silver conchos. Accented with clear crystals. 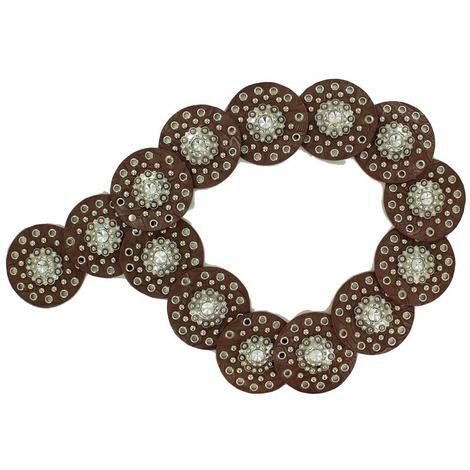 This chocolate brown tooled belt by Ariat features cutouts, round silver conchos with rhinestones, silver studding along the edges, 1.5" wide, and it also has a floral embossed removable silver buckle with rhinestones. 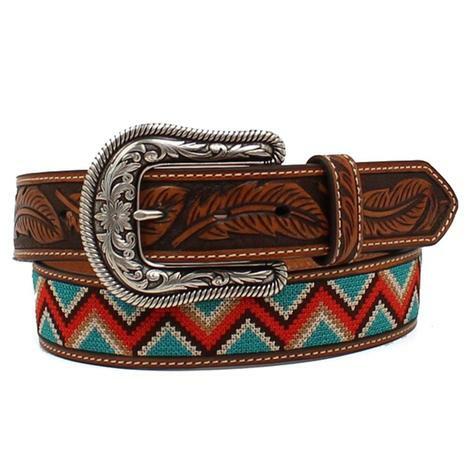 This western belt is approximately 1 1/2 inches wide and features hand painted turquoise features with a stained Aztec print edges. 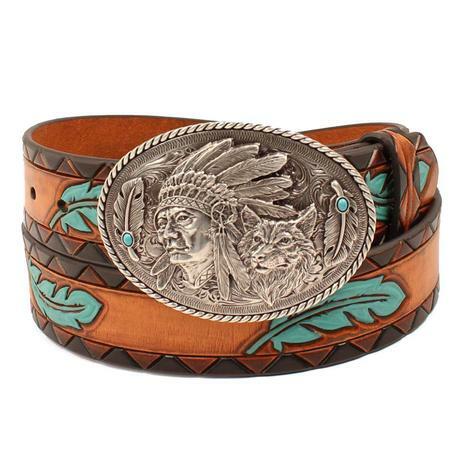 The oval buckle features a beautifully detailed chief and wolf design. 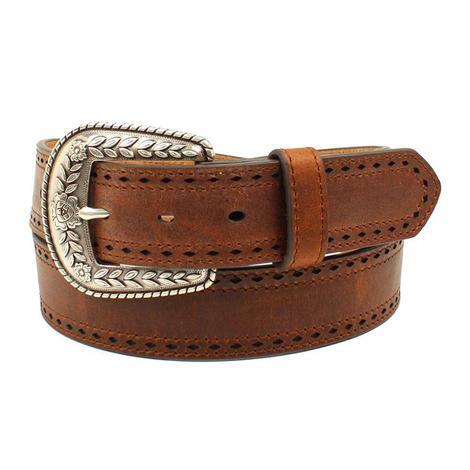 This genuine leather brown belt by Ariat is accented with a tooling design and cutouts. The belt measure 1.5" wide. 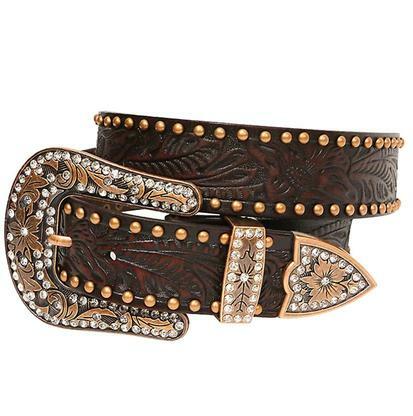 This women's western belt by Ariat has genuine brown calf hair with silver colored nail heads and clear rhinestones. Add this one to your collection while supplies last! 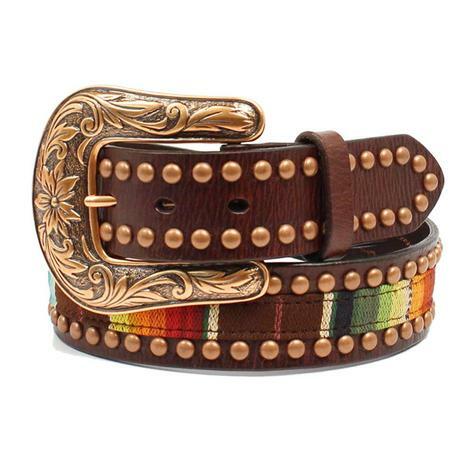 This ladies Ariat belt features a serape fabric down the center of the strap, along with copper studs on both edges. It has an interchangeable copper buckle that completes the look of this awesome belt. 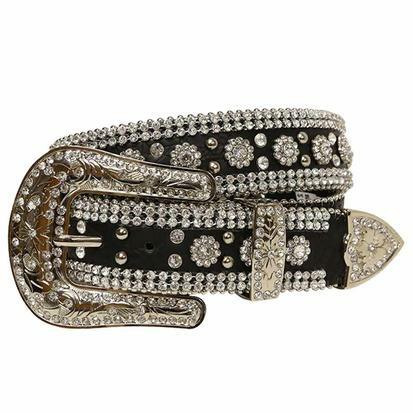 This Angel Ranch women's belt has a black gator print leather belt with silver tone studs and clear crystals. Removable silver tone buckle set with clear crystals. 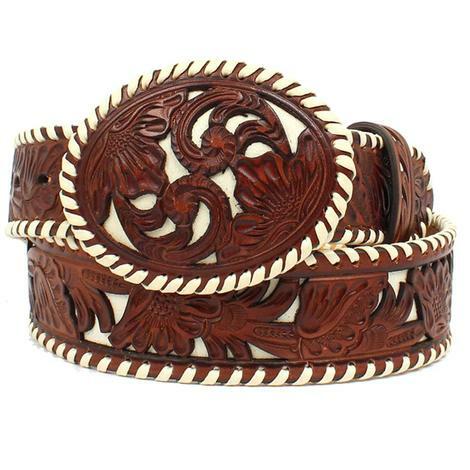 This belt by Nocona is chocolate leather with a western floral center and turquoise lacing trim design. 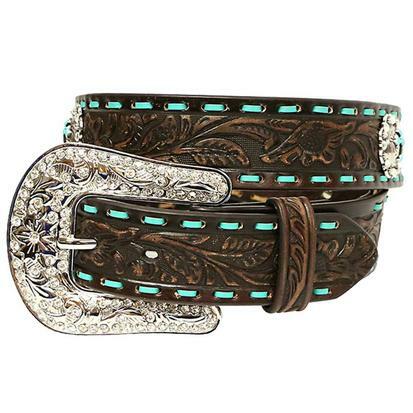 The belt is accented with silver conchos and has a turquoise cross center and clear rhinestone accents. 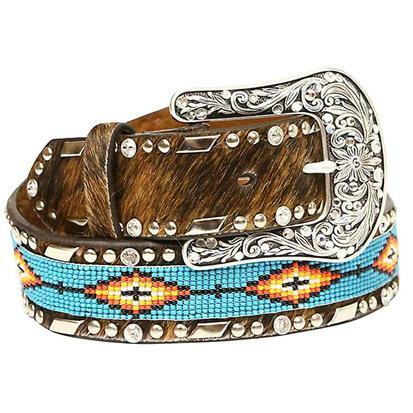 This women's belt by Ariat features a turquoise multicolor Aztec beaded center design with rhinestone encrusted silver concho end pieces. 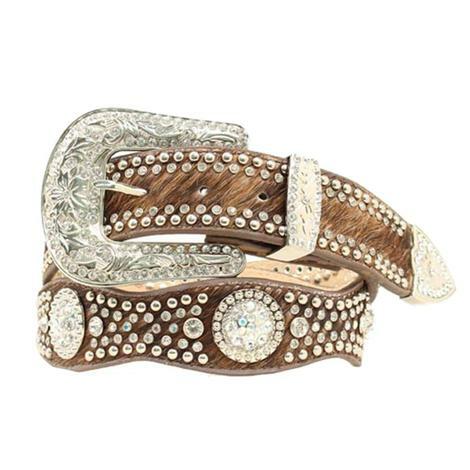 The belt comes with a removable silver rhinestone buckle. 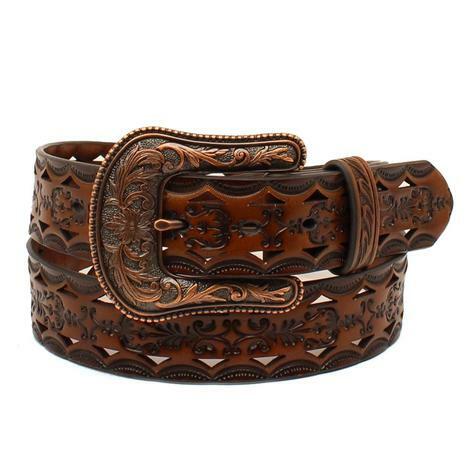 This western styled belt by 3D is made with genuine dark brown genuine leather that is embossed with a detailed floral design. Removable antique copper tone buckle set with clear crystals is included.